During the past 50 years, the USA and other industrialized nations have witnessed a remarkable increase in mortality from carcinoma of the lung. Today, this disease is the number one cause of cancer mortality in the USA, accounting for more than 180,000 deaths annually . Unraveling the various causes of this increased risk has required painstaking epidemiologic studies, but it has become apparent that cigarette smoking is the single largest preventable cause of lung cancer in the world today . It has been estimated that between 85 and 95 % of deaths from lung cancer are directly attributable to smoking [1, 2]. Cigarettes are the leading offenders, but pipe and cigar smokers are also at risk, though only if they inhale the smoke [1–3]. Asbestos workers are also at increased risk for lung cancer, particularly those who smoke tobacco products [4, 5]. It is the purpose of this chapter to review the characteristics of asbestos-associated lung cancers and to discuss the role of the pathologist in recognizing asbestos as a causative factor. 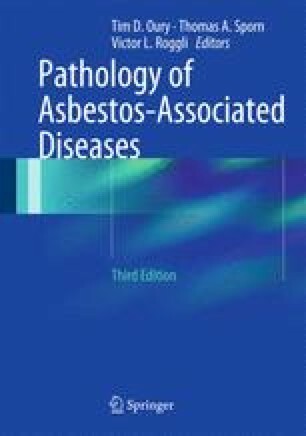 The historical context in which asbestos was recognized to be a carcinogen for the lower respiratory tract will first be reviewed, followed by a discussion of the epidemiologic features of asbestos-related lung cancer, including the role of asbestosis, synergism with cigarette smoking, and asbestos fiber type. The role of cytopathology in the diagnosis of lung cancer in asbestos workers is discussed in Chap. 9, experimental models of pulmonary carcinogenesis in Chap. 10, and lung fiber burdens in asbestos workers with lung cancer in Chap. 11.